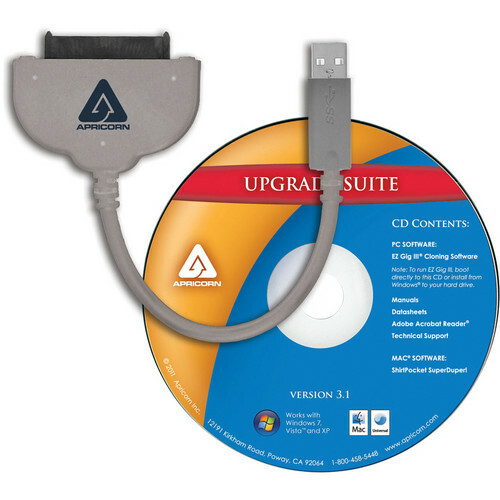 The SATA Wire 3.0 by Apricorn provides a high-speed USB 3.0 connection to most any 2.5" SATA notebook hard drive or SSD. It makes transferring data from your computer to a new hard drive easy with its included EZ Gig cloning software for PC and ShirtPocket SuperDuper! for Mac. It can copy your OS, data, applications, documents, address books, e-mail, settings and more from an old drive to a new one in just a few simple steps. SATA Wire 3.0 allows you to connect your hard drive to most any desktop or notebook computer via USB 3.0. It's an ideal solution for anyone needing immediate or temporary access to a hard drive. With Apricorn's Upgrade Suite, the SATA Wire 3.0 includes everything you need to get up and running right out of the box. Box Dimensions (LxWxH) 7.4 x 6.5 x 2.0"
SATA Wire 3.0 Notebook Hard Drive Upgrade Kit with USB 3.1 Gen 1 Connection is rated 4.8 out of 5 by 43. Rated 5 out of 5 by Frederick S. from A good SATA wire - fast and reliable I used to shut down my computer and hook up a drive to a spare SATA cable. Then I found this Apricorn. I just threw away the disk, I wanted the wire. It's good and solid, the connection tight, and it's fast. I don't know what a SATA connector could do to be slow, but this doesn't do it. I use it to copy backups onto spare laptop drives, and I HAVE used it to clone a disk, but I haven't tried their software. I had one of these for a couple of years, then two, and this time I bought 3 and put one at each of my work sites. Rated 5 out of 5 by JD from Product worked great! Cloned to SSD with no errors! This adapater and included software worked perfectly to clone to my new Samsung SSD 500gb drive from my old HD. No errors at all and almost all drivers carried over. Rated 4 out of 5 by Willie from Works just right!! Bought this so that I could upgrade my new laptop hard drive from 320 GB to a 500GB purchased from B&H as well. I thought it would be rocket science to do so, but this cable made it easy. Best of all, I didn't even need to install the software, it has an option to run from disk... and in a few minutes my disk had been copied. I plugged in the new disk and its as though my laptop was shipped with a 500GB disk... Great cable if you plan to upgrade any computer drive to larger capacity. Rated 5 out of 5 by Anthony of MAJ'C Images from Simple & Cost Effective I used this with my Crucial MX200 purchase to clone my existing HDD. The GUI is user friendly. Once I was sure the SSD conversion was stable, I used the software to reformat my HDD for use as file storage on my laptop. Rated 5 out of 5 by jmartin17 from The Cable Works I did not use the software, opting instead for the Samsung software, so I cannot comment on the software. The cable though, worked exactly as described! Good deal! Rated 5 out of 5 by Jose from Super easy to do This is a very easy product to use, just pop the CD in your optical drive and follow the instructions and done. The program will do the rest, no need to worry if your other HD is bigger than the one you are replacing. Your old HD information will be copy to the new HD to include Outlook settings and other personnal settings. Two laptops done very quickly. Works with Solid State Hard drives as well as a hybrid drives. Rated 5 out of 5 by Alex from Worked great! Used this to transfer files from one hard drive to another. Worked very well and had no problems. Rated 5 out of 5 by B from Works as intended The item works as described. I did not use the accompanying software. Is this available for Win 8? Seems to be really out of date. It will work with Windows or MAC. You do not need to use the software that comes with it. Will this work with the atomos caddy's (Shogun) with ssd's in them? This is used to connect directly from the SSD itself to the USB port on the computer. It can not be used while the drive is inside of a caddy. Does the target drive have to be initialized n/or formatted before using Apricorn? You do not have to initialize or to format the drive, which you want to use to install the copy of you operating system (OS).Two configuration are possible : 1- the source drive (with the OS) is already connected in your desktop or laptop, and the destination drive (where you want to copy the OS, 2.5 drive format) has to be connected to the Apricorn SATA wire interface.2- the source drive 2.5 (with the OS) is connected to the Apricorn interface, and the destination drive has to be connected directly in your desktop or laptop.Nota :a : the Apricon Sata Wire interface is only compatible with the 2.5 drive format.b : So I used these two modes (with a temporary 2.5 HDD) to transfer the OS between two hard drives in 3.5 format.c : tha Apricorn interface can be used without the EZ Ggi software, just to connect a 2.5 HDD or SSD to an USB port to access as an external drive.d : I had an issue to boot on EZ Gig IV (Version: 4.3.8 | Size: 24.34 MB) from my Dell XPS8900 so I contacted Apricorn by e-mail, and they provided me a beta version that it fixed this issue. I really appreciate their support. Hello, is it possible to select the data that is transferred to the new hard drive? For example - on my new SSD, I would install a new OS Windows 7, then transfer all my other data to the new SSD. Bottom line, I would like to cone my new SSD, except for the operating system. Thanks for any help. of course you can, this adapter is like any sata3 to USB3 adapter or enclosure. Being USB STORAGE it's platform and OS independent.